In this article, I want to go over a fundamental mechanism any investor should at least be aware of: Cash Flow Diagrams. If you look to the right, you’ll see a common example. The first line, that goes upwards, represents a burst of positive money you receive. 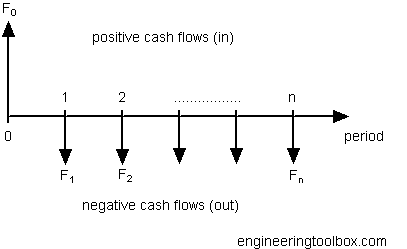 The following payments, or negative cash flows, are essentially used to payback the initial cash flow. Do you recognize what common financial structure it is where you get a big chunk of cash up front, and then make small payments over a certain time period? That’s right, a loan. For another cash flow, check out this one. It is the opposite. It shows a big chunk of cash being put out, followed by several small cash flows coming back. Can you think of any examples that match this? Buying a rental property and receiving monthly rent checks. Buying a big chunk of stock and then receiving dividend payouts. At the heart of any financial transaction, investment, or purchase, you can probably see one of these two diagrams. When you are trying to make a choice on whether to buy a big chunk of stock OR put the money into a rental property, its useful to sit down and chart all the cash flows. Then, you can compare the two. The ratio between the the periodic payments and the invested cash is known as the cap rate, and it’s important to understand the cap rate for each usage of your money. When one opportunity yields less than the other, we refer to it as opportunity cost. When you are about to pick a certain investment vehicle, it’s good to also make a list of the risks involved. Real estate has certain risks. Stocks have another. And paying off your mortgage early may carry fewer risks, but also consider the loss of opportunity if you don’t build up any positive cash flows in the future. Are you painting yourself into a corner of being house rich/cash poor? Ever see those commercials where you can “get your cash now?” They are all about taking over your tiny positive cash flows, and swapping them with a big one right now. Believe me, those people make money. They simply calculate your cap rate, plug in a profit factor on top, and essentially calculate a smaller amount of cash to hand you than if you had kept the cash flows for yourself. Hopefully, this series will have alerted you to the benefit in understanding some financial basics. Happy investing! Is defeating the beast of debt the best way to reach retirement wealth? I’m back! I’m been on a hiatus for the past 4-5 months, nose to the grindstone writing Learning Spring Boot. But I turned in my last rewrite about two weeks ago, and after a bit of decompression, am more stoked than ever to write! 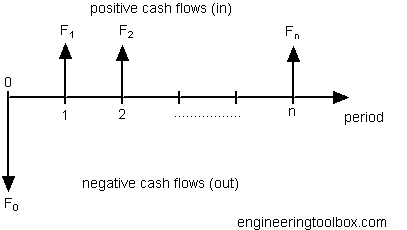 I was spurred to comment about cash and cash flow based on what I heard on the radio. I listened as someone talked about how to get out of debt and move forward with reducing costs. The person calling in was stuck with student loan debt. They had already tackled some other things like credit card and auto loan debt. As I listened, I kept hearing the same things. Get rid of debt, get rid of debt, and more git rid of debt. On the face of it, it make sense. But I kept thinking, what happens when they get past all this debt? What then? Consumer debt is a menace. Many people take on too much. They don’t budget well. Translation: we all make more than enough to get by. Because we don’t manage our money well, we end up spending too much on things we don’t need. Get it under control, and you can go far. But at that stage, people start stuffing their spare change into 401K plans and IRAs. They don’t realize how much they are shooting themselves in the foot. 401k funds have shown a 20-year history of performing at or below 4% annualized growth. How bad is that? Inflation is slated to be around 3%. This means that if you get the average (and don’t tell yourself you’ll beat the average), you are barely ahead of inflation. How good is that? When you consult a financial advisor, they will talk to you about how this fund and that fund are performing. That may be true, but there are some innate biases built in that aren’t obvious. First of all, the funds that exist today aren’t the same funds that existed ten years ago. When funds perform poorly and people dump their holdings, brokerages houses end up closing things out. Those that are left, get transferred into another. And the next year, if you were to ask for the brokerage house’s average performance, the closed out fund isn’t part of that picture. Another factor not mentioned is that funds don’t invest; people do! People buy funds. People buy stocks. People buy real estate. Hence, the question you should ask an investment advisor is how has his clients performed? What is his client’s average annualized growth rate? What is the average/minimum/maximum life he has held clients? A good investment advisor that is making his people wealthy should have long standing clients. Their annualized growth rates should be high. Measuring the performance via a prospectus is the wrong focus and won’t reflect how clients are doing. In other words, it won’t show how YOU will do. So if you realize that 401K funds aren’t the answer, the next question is: what DOES work? What are you willing to do to get there? I invest in real estate, stocks, and EIULs. And being cash flow positive with no consumer debt, I am willing to take on debt. The caller on this radio show sounded unready for anything like that. I fear they will clear out all this debt and then be unready to entertain borrowing money to invest in real estate. Instead, they are going to go with the host’s plan of buying up mutual funds. Things will really sizzle, because they won’t be hampered by car payments, student loan payments, and credit card payments. And they will make it to retirement, perhaps saving up $1MM. And that is when they will discover that it’s not enough. Their financial advisor will tell him or her that they can start withdrawing NO MORE THAN 4%, i.e. $40,000. Then Uncle Sam will ask that they submit $4000 in taxes. (I’m being gracious and assuming that landing in a lower tax bracket results in an effective tax rate of 10%). At the end of the day, this person that tackled small bits of debt thirty years earlier, is now raking in $36,000/year. That maps to $3000/month. Can you comprehend living on that tiny amount of money? Do you see cruise trips or spending a month in France on that kind of cash? Was slaughtering the beast of debt and not considering future loans to buy cash flowing real estate worth it? Not for me. I plan to reach retirement with MUCH more than $1MM, because it takes much more than that. Stay tuned for more discussions about building retirement wealth. Posted on October 2, 2014 September 30, 2014 Categories 401k, cash, debtLeave a comment on Is defeating the beast of debt the best way to reach retirement wealth? I just recently bought a new car with cash. The feeling was great! Let me fill in some details. My wife and I have been looking into another car for at least a year. We had looked at many models and had a list of features we wanted. We were also open to buying used, perhaps up to 2-3 years old, if it was in good shape and didn’t have gobs of mileage. But the key part of it was: it would be a 100% cash purchase. Unfortunately (or fortunately), we couldn’t find anything used that didn’t have high mileage. It only cost a few thousand more to buy a 2014 new car with less than 200 miles than a used car with 70,000+ miles. (Some of these used cars, in fact, cost more than what we got). To top it, the features they include with the baseline model were WAY more than we needed. Given we have smart phones and our own DVD player, the upgrades were frankly unnecessary. Top priority: I didn’t want to take on a car payment. I’ve heard statistics say most cars you see driving down the road are dragging along a $400+ monthly car payment. If you’re reading my blog site, then I can bet you have already heard the pitch to save up and buy a car with cash instead of financing it with debt. I heartily agree with this practice. The other piece of advice I often read but doesn’t seem to get stressed as much, is to try and make your car last a long time. Don’t get caught up with “car fever” and think about new one three years from now. That’s already burned into me. My wife’s car is eleven years old, and our minivan is seven. 57 months equates to about five years. That’s good to hear! But better yet, if you can keep your car for ten years, you will be way ahead of the curve. Cars require a significant outlay of capital. The last car I bought was seven years ago, and I’m still driving it. What if you can’t buy a car with cash? I can certainly empathize with those that want to pay cash but simply can’t. I don’t want to get preachy. There are radio shows and forums that talk about how you CAN in fact buy a car all cash. You just have to lower your expectations, save, etc. Everyone reading this has probably heard all about it. I’m not hear to sway you in that regards. What I want to write about is how my ability to pay all cash represented a more deep seated realization. My net worth and money making efforts have grown to the point that I CAN pay all cash for a car. Given the current performance of my rental properties, EIUL and dividend paying stocks, I feel like the next time we buy a car, we will be even BETTER off than now. I don’t have the data on hand to back this up, but I’m speculating that those that don’t have a solid wealth building plan in action probably tends to wards buying cars more often and using financing. Cars are nice and shiny. We all like to have them. I’ve driven through neighborhoods where things don’t look very wealthy, but people still seem able to have a couple nice, new cars. It’s probably the biggest “toy” people can buy and get it financed through the bank. As my father told me the last time I went car shopping, “your goal is to beat the average.” That applies to building wealth, buying cars, and anything else money related. Cash flow is what we need to operate. Cash flow pays for food, rent/mortgage, gas, and everything else we need. As one person commented, “you can’t eat net worth”. And he’s right. In fact, his corollary point was that net worth can flutter around based on the state of Mr. Market. Many people will happily point out “cash is king”. All of these things are quite true. But it’s actually a balancing act. As Jeff Brown has pointed out in many articles, if you focus on growing cash flow, it retards the growth of net worth. Focus on growing net worth, and cash flow will suffer. They are two sides of the same coin. Both cash flow and net worth need to viewed in their proper light. Cash flow is the money you can tap. Net worth measures how much cash flow you can generate. The bigger your net worth, the bigger a cash flow you can generate. Let me give you an example. Since I took on dividend growth stock investments (not mutual funds) as one of my baskets of passive income, I have been reading a lot of websites with differing viewpoints on stocks. One site I read repeatedly mentions Disney (DIS) as a company that knows how to adapt very well to changes in technology. They have a strong grasp on how to roll out the same top notch movies every time a new way form of technology comes out. Remember buying them on VHS? Then came DVD followed by Blu-Ray. Every time a new way to consume media appears, Disney has their A-game on, and is ready to re-sell you the same movie you’ve been watching for twenty years. I have a strong attachment to Disney. I love their movies. But that is not all. My wife works part time for Disney. We travel periodically to our vacation home outside of Orlando and take the kids to Disney World. We even took them to trick-or-treat earlier this month. You want to talk about a place that appears to have suffered no recession in the past five years? Disney World is it. I’ve been there for the past five years, and everyday, the place is packed. So I have a strong desire to buy their stock. But I won’t. Know why? Their dividend rate is 1.1% and they only pay once-a-year. Compare that with Vanguard Natural Resources (VNR), the company you probably have never heard of outside this blog. They’re dividend rate is 9% and they pay on a monthly basis with a tax deferred basis. On the surface, it would appear that Vanguard beats the pants off Disney, but guess what. If you focus on cash flow you can make Disney beat Vanguard every time. You simply buy ten times as much Disney stock, and your cash flow will exceed that of Vanguard! Disney is solid. I’m sure they’ll continue to stay in business for decades to come. That $10 billion company certainly isn’t “mickey mouse” when it comes to making money. I’m sure you realize my suggestion at buying 10x DIS is ridiculous. But why? Because if Vanguard is doing that well, why not simply buy ten times more Vanguard? I hope this scenario seems simple to you. The trick is, people don’t recognize that it appears in many other places. For example, people will buy real estate deals in California and put down high amounts of capital to make it “cash flow positive”. That is the same thing as buying lots of low yielding stock to make it flow lots of cash. They don’t realize they are killing their potential to grow their net worth because they are focused on one thing: cash flow! If you take your capital to other places, like Texas, you can find real estate deals where you might get the same amount of rent for much less capital input. In essence, if you seek the right market, you can get a better yield. So always look at both and make sure your total net worth is growing at a suitable level with tolerable risk. Back in college, I took a course in engineering economics. I still have the textbook upstairs. I remember learning how to draw cash flow diagrams to solve problems. Essentially, you draw one large arrow anytime you are either investing a big chunk of change or cashing on a big sale. The arrow stems downwards if its an investment, because you are effectively losing the money in present. This is followed by a series of short arrows usually on a yearly basis, to represent the return on your investment. If you made an investment, you would have a big negative arrow. The tiny positive arrows represent your payback, i.e. yield. Essentially, at some point in the future, the small positives add up and exceed the big negative. And that’s the thing. Everything you do with money is essentially either plunking down a fistful of cash for small paybacks, or doing the opposite by making lots of small payments to receive something of big value later on. Anything you do must be weighed on whether the rate of payback is in your favor. Something that I was always interested in was installing an array of solar cells on the roof of my house in order to offset the monthly electric bill. People all over the internet are eager to share their story of how they installed a solar array and knocked their bill to but a fraction or even to zero. I wanted to do the same. But before I moved a penny, I started researching what it would cost me. And I wanted to know when I would have saved enough to pay it all off. The answer shocked me and caused me to scrap the whole idea. Solar power cells essentially go at the rate of $4 per Watt. Spend $4000, and you get an array that will yield 1kW of power. I looked at my current power bill at the time and noticed that the rate about about $0.10 per kW-hour. Another nugget of knowledge is that back then, I lived in Florida. I visited a web site and figured that in Florida, you get an effective five hours of sunlight each day. To break even with existing cost of electricity, I need almost 22 years. This is where a big negative arrow of $4000 needs 22 tiny arrows of about $182 in cost savings. I have read that panels are insured for up to 25 years, but that is cutting it close. What if the panel lives up to its 25 year lifespan? Will it have been worth it to have invested $4000 in today’s dollars to have netted $547? Over 25 years, that renders an annualized growth of 0.5%. That is way less than the inflation’s 3% rate. It would be more cost effective to take $4000, buy some shares of VNR stock, and use the monthly dividends to pay the power bill. The solar cell would save me $0.50/day or $15/month. $4000 of VNR stock would yield about $28/month and probably grow in value and increased dividend payments down the road. That is when I shelved the whole idea of buying solar power cells as the means to save on power bills. If you want to do it to help reduce pollution, but all means pursue it. But don’t take it on as a great money saver. It isn’t. FYI: This doesn’t include installation costs which sometimes doubles the entire procedure. And even if you factor in a 30% credit on the entire installation, it still comes out costing more than $4000/kW. This article isn’t about the cost of solar power cells. It is how everything you do with money needs to investigated on whether it produces the yield you think it does. It’s critical you find the break even point. Some things, like loans, break even when you have paid it all off. In that case, the emphasis is on the rate you are paying. Is there some other way you could invest the money and come up with a better rate, i.e. usage of your money. I have a HELOC costing me 4%. I also have an investment that yields almost 9%. When it has completely paid off the HELOC, the yield will continue all the way into retirement, and hopefully, as a legacy to my wife and children. In the end, I will end up with more harvested money than if I had simply taken all that cash and paid off the HELOC immediately. I might have paid interest along the way, but eventually my stock will produce enough cash to have even paid for all that interest and still be producing money. It’s good to always be thinking, “what would I do if I had a bunch of money?” I was reflecting on a previous article I had written, and really observed how the people that get a lump of cash often call a radio show because they DON’T know what to do. It’s important that we aren’t caught off guard and panic, but instead are prepared with a plan in mind. The reason is, opportunities occur. We need to be prepped and ready to go with putting that money in action. For a long time, many years in fact, I had developed an approach that any big chunks of money I received would be sent into a spare bank account. I would “park” the money there, and let it collect. That way is was a little out-of-sight/out-of-mind. Every few months, I would examine the bank statements, and think about what to do with it. Back in 1999-2000, before banking went online, I worked a particular assignment that paid me double my usual salary. I also had huge reimbursements for food and lodging. So I called up my local bank and asked if I could set up an automated deposit to another bank. My checkbook was filling up too fast! They said sure, not a problem. Apparently, they’ve been doing this type of stuff for decades! Suffice it to say, working this way for over a year allowed me to sock away plenty of cash. At the time, I bought mutual funds and also kept enough cash to put a down payment on a house a couple years later. I didn’t just spend the money on things, I saved for the future. My wealth building plans of today are very different than back then. At one time, a few years ago, my plans had shifted to the point that if I came in contact with a big sum of cash, I would focus on paying off our primary mortgage. Much to my benefit, the money didn’t materialize before I learned to NOT DO THAT. Can this money be used to buy cash flowing assets (real estate or VNR)? Would the cash flow be enough to pay any carrying costs and still profit? If not enough for real estate or VNR, what about a solid growth stock like BRK-B? Have all costs, risks, and rewards been considered? That is how I was able to take the sale of my previous home and quickly figure out that it would be better to buy a big position in VNR instead of paying off the HELOC. When the HELOC costs me 4% and VNR pays 8.6%, then the profit margin is clear. I am also looking at cashing in my next stock option to buy even more VNR in order to pay off the HELOC faster. Finally, when I withdraw the remains of my 401k, I’ll probably buy another chunk of BRK-B. There are no carrying costs involved with that chunk of money, so I think it would be good to “park it” in BRK-B. Should pay much better than a money market fund let alone some index fund. What do these options provide? I’m now at the point where if one part of my wealth building plan needs help, another part can assist. For example, if BRK-B grows really fast, it’s always an option to sell a piece of it and pay off a real estate loan. Or if I build up enough VNR and pay off the HELOC, I can target the monthly dividend towards the rental loans or buying more BRK-B. Or I can sell one of my rentals and buy another EIUL in four years and a day to lock in the wealth. Options beget options. The more active I make my role in my investment plan, the better I seem to do. It also pays to get out of investment vehicles that offer little if any choices and have a bad history of performance (401k and mutual funds anyone?) By being ready with plans in place, we are more likely to spot these opportunities and not get steered into destroying our wealth building vehicles like mortgages out of panic from some radio host.